Player Upgrades The design that drove the most amount of feedback in MUT 18 was unquestionably Power Up Players. It allowed you to have the most powerful version of a player, but it came with some limitations that we could not handle without additional development. We definitely heard and understood the feedback and invested in building support for Power Up Players with Player Upgrades in MUT 19. Let’s start from the beginning and discuss what made upgrading players difficult in Madden NFL 18. First of all, it took a lot of exploring through Sets and knowing exactly what you needed to do. This may not apply to everyone who is dedicated enough to read this blog, but Power Ups were too complicated. How many times has a brand new player come out and he looks absolutely sick except his Chemistry doesn’t match what you personally value (c’mon EA!). Well, we as MUT Producers are removing ourselves from that equation and turning it over to you, the players. 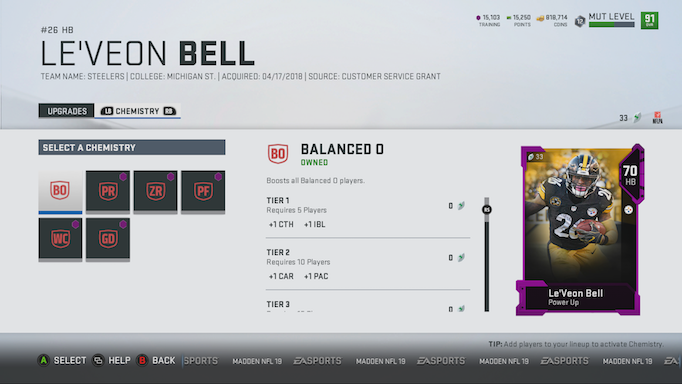 In MUT 19, almost no players will come with Chemistry (outside of Team Chemistry) already equipped. Instead, you will have the option to upgrade that player which opens up a Chemistry Slot and a bank full of available options. All in all, it looks like Madden Ultimate Team in Madden NFL 19 is going to feature something for everyone. While not all of the biggest complaints were actively fixed, it seems like there’s an attempt at honesty in the sense that some things are the way they are for reasons that may annoy some, but work to the betterment of the mode’s experience overall. The chemistry changes and solo battles in particular sound like really solid additions to the overall experience. As always we’ll have to see it in action, but there’s some really good potential here. What do you think about this year’s Madden NFL Ultimate Team mode? Not for me, either, but hope it received some nice additions for the people that enjoy it. This. This is good stuff worth highlighting for all Madden players. That is nice CM, very nice. Finally, a 3rd down back. MUT Squads returns in Madden 19 and, new this year, we have added the ability to play games against the CPU. You and two of your friends can team up to take on challenges that will be a mix of various difficulties, playstyles, and even weather. The even weather part would be nice. Eh, SS, I'll disagree with you. I will take efficiency any day over PITA setups. Thanks for pointing this out. I skimmed thru it and totally missed this. Definitely, nice to see. There will undoubtedly be stuff in the MUT development that benefits all gamers, and this seems like a really solid development that also benefits sim offline guys such as myself. I'm all for more specialist depth chart positions and look forward to more of this as they continue to develop the game and find ways to allow us to use the whole roster as creatively as real NFL coaches do. Does it need to be groundbreaking? It's a feature literally every sim-minded Madden player on this forum will absolutely use. Having the game automatically recognize these specialist roles is far more convenient than having to manually set up formation subs, especially when formation subs may break if a given player is removed from the team. In addition, these roles will exist on CPU depth charts as well, so CPU game day roster management is automatically better by default. I'm not going to downplay the importance of this addition. Good stuff. While there are open questions about any number of things, this looks to be a release with major polish across several modes and gameplay. Give attention to the things that are important to us and present them well, and I stay tuned in and playing. It's the little things too. Interesting...if they're adding the ability to play against the CPU in squads in MUT, are they trying to showcase the AI? Hopefully it was improved. Are these the Player Positional Archetypes? is that new menu layout including main menu, roster menu, franchise mode menu beside this ? There are some awesome additions to MUT and game play in general. This was a very pleasing reveal. Look forward to more information and game play video. Immediately identifying and fixing the key issues with upgrading players and chemistry made this reveal great from the start. Not my mode but definitely a few golden nuggets in this write up that has me intrigued about CFM possibilities. i prefer to use formation subs although that breaks with IR etc. Why not ST positions? It is interesting that weather is included as part of the key details shown on the 5th screenshot, which is about squads. First game shows: Rookie level; 2 min quarters; Day: Warm. Would be nice if temperature affected player performance. Warm day would be good, but a hot day would see fatigue affected negatively..Cold weather makes catching and throwing more difficult, etc. Granted it is in MUT, but games against the CPU would be fine with weather affects. The weather would not be welcome in competitive matches. As someone that plays MUT regularly, this is nothing but great information. They addressed a lot of issues from Madden 18 like powered up players and Chemistries while still adding things for different types of players. One of the biggest complaints was not enough solos and they addressed that as well. They added competitive solo’s for those that don’t care about playing against humans and they added a pseudo practice arena for Squad players by allowing you to play against the CPU. Nothing in this article fed into the Pay-to-win fears that are surrounding MUT. Overall, I thought it was a great deep dive. I can't recall from past Maddens, but has Madden ever had all these positions highlighted in previous Maddens? which screenshot you said about new depth chart position ? I can't recall from past Maddens, but has Madden ever had all these positions highlighter in previous Maddens? Oh gotcha. That would be a pretty cool addition to the game special-teams is 1/3 of football. This looks like one of those odd situations where MUT features could actually mingle with franchise quite nicely. Maybe I'm understanding Carlos's concept of "balance"
See, for me, if it's been never, they have a right to tout it as new, even if you could do it a backdoor way that took awhile. I can't wait for the upcoming hot takes with all the deep dives arriving and gameplay during the next month or so. I did notice the deep dive said the new positional formation breakdowns "will benefit all of Madden". So this is a good sign. I love situational football. That's a huge deal for me and would be awesome in franchise. Chemistry is one of my favorite features in the NHL series. And, to me, it works much better than "confidence". I just remembered I need to add a few more from my list in another thread. You maybe surprised and join the dark side on release day. I definitely like seeing the solo options listed and MUT Squads vs CPU. I do not want to play against people that drop real money on packs. This!!!!! I'm not a huge 32 team control guy but hopefully, this and archetypes help the CPU (especially 3-4 teams) so we don't have to go through and edit every team's nickel and dime packages. What I'm hoping is that the CPU knows how to manage their depth charts and not just go highest rated guy overall like they did for kick returning. I don't want to see Todd Gurley returning kicks. This was one of the main reasons I control every team in my franchise, cant stand seeing that happen and then Gurley will already have his hands on his knees gasping for air first play of the drive smh. It's little things like these I wish we could bring up to devs before release so they could be solved quickly. Been this way for years though eventually they have to see things for themselves too, could be something they just don't care to fix, easier to just say go by rating over position and skillset. Hopefully its fixed this year though. I gave up on MUT...until the fix the match making so my 80 overall team doesn't get matched up with a 99 overall team there is no point in playing this mode. I have no interest in playing the cpu and have no in interest in paying to win. Love the card collecting aspect and enjoy building a team but after a couple years of it I find it pointless unless you want to pay $ to build. Or can grind endless solos vs. the cpu....neither are appealing to me. I'm curious as to how it will work exactly. Honestly, I think formation subs are a terrible way to get the sim results folks are looking for, because that's not how it works. I prefer players based on situation, which allows me to use my third down back in any formation. With NFL teams, let along Madden teams, using 3 or more wideouts on a regular basis, we need to be able to use nickel defenses as run defenses or pass defenses. So that may affect who I want in as my LBs and DLs. Overall, I'm still not a big fan of the upgrade path on players. It needs more risk/reward, and now it seems like they are eliminating all risk. Being able to make any player any chemistry just feels cheap. I really like that in The Show players get better based on real life performances. This makes it really fun to grab your favorite team's young guys and hope they develop. I'm a Chiefs fan, so I'm banking this entire year on Pat Mahomes. Obviously, with no NFK games under his belt, he is not going to be rated very high. But if he goes off like Chiefs fans are hoping, it would be cool if his card got better. It also makes looking for platters more interesting, as you can find real diamonds in the rough, if you know that certain players are close to taking over the top spot on a depth chart. Football may not lend itself to this as well, but I think it could work. If player movement, animations, and AI is good I might check out Solo Battles. I always look forward to playing MUT in the early stages. The time from early release to updated rosters and sliders is all MUT focused for me. I can honestly say that I stayed away from upgrading players with sets because I either didn’t know how to or didn’t feel like searching through lists and lists of categories just to find the certain player I wanted to upgrade. This new layout for upgrading players will definitely ensure that I will be upgrading players this year. Maybe now whichever legend I choose I’ll be able to keep viable for some time! Squad Battles coming to Madden? Definitely picking this up. Also, I love that they are adding specialist positions. Hopefully there is more formation and depth chart tweaking we can do. I watched that interview with the new Senior Producer, I am excited for his changes. That menu looks a lot cleaner than what we have seen in the last couple editions of the game. Those changes to the depth chart definitely made the needle come to life for me just a bit. The most important part of the game to me is on the field, and there definitely seems to be a greater focus on that area this year. I really want to be able to see the fruits of my labor and choices though. Right now there are still too many areas where I'd rather have a 66 OVR 84spd OLB in my 4-3 over a 86 OVR 78 Spd guy because the higher rated player simply brings nothing to the table, and the 66 OVR makes more plays on speed alone. I need to see that won't happen any longer before I really start to get interested in buying what the Madden team is selling. You'll never completely remove the need for athleticism, but at least it's been toned down considerably. Speed was once so paramount it was the only thing you would look for in a player; now it's probably about fourth or fifth on the list regardless of position. That being said 78 SPD is *AWFUL* for a LB, and I'd expect that player to be trash regardless of his ratings. This is of course based only on what has been released, but right now I'm not surprised that EA appears to be bungling the 'specialists' feature by implementing it incorrectly. Rush ends/tackles, power backs and sub linebackers are situational, not formational. This needs to be based not only on formation, but down-and-distance. A team isn't going to move a defensive end to tackle on third-and-three because they are in a nickel to match the offensive personnel, they are going to go with the rush package in passing situations. A power back could come in on second- or third-and-one even if the offensive formation is shotgun with four receivers. Hopefully EA isn't basing specialists on formations alone, because that's simply wrong. Agreed. But this is why I said that formation subs were so awful in the first place. My hope is that they will work like the third down back, which is inserted situationally. Would be better if there was a simple selection in the play calling screen, like maybe a dialogue box letting you know who is being inserted, with an option to turn it down.